. : Welcome to R&M Greenkeepers - Skip Hire :. 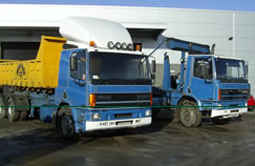 R&M company currently has eight full time skip loaders, 3 full time hook loaders and two bin lorries on the road. 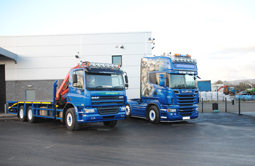 With more than 700 skips in circulation we are one of the largest waste carriers in Mid-Ulster and service skips for both private and commercial customers while offering the most competitive rates. Offering everything from mini skips to midi, jumbo covered and enclosed, we also have 20, 30 and 40 cubic yard roll on roll off for those larger jobs. Commercial clients can also avail of our provision of bin services with our big-bite and bin lifters. 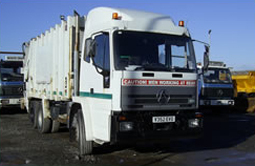 We also ensure that all our clients are kept involved with trying to recycle as much of their waste as possible. Please contact our office and see how competitive our rates are. 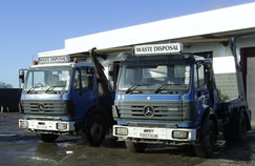 Vehicles used in Skip Hire.